Coca-Cola is the world’s most popular soft drink brand. So it’s not surprising that statistics flowing from its global-leader status can be mind-boggling. For example, in each second of every day, people consume 10,450 Coke drinks, from its eponymous sodas to waters and fruit juices. And worldwide, 1.8 billion bottles of Coke drinks are sold daily. 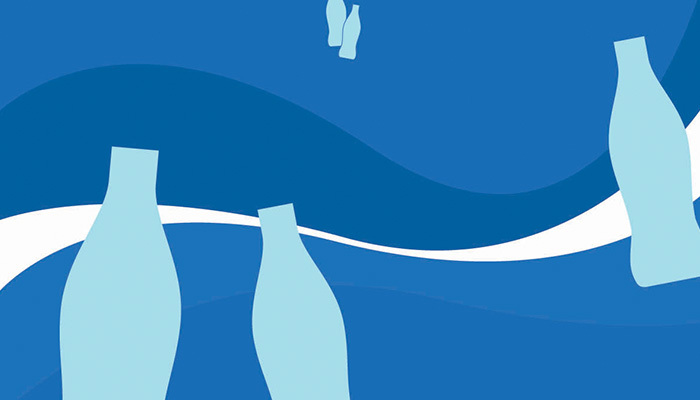 To produce all those drinks, Coke bottlers use more than 79 billion gallons of water a year. That last stat—roughly the amount of water that pours over Niagara Falls in a 30-hour period—is as significant as it is impressive. Water is key to the success of Coca-Cola and all the other beverage makers worldwide. It not only is the main ingredient in each bottle or can of drink produced but is also essential to their manufacturing processes, particularly in the cleaning and rinsing of equipment. “If we don’t have water, we don’t have a business. That’s pretty obvious,” says Paul Bowen, the Coca-Cola Co.’s director of sustainable operations. Which helps explain why Coke has become a global leader in using a variety of proven, highly engineered technologies and efficient production techniques to drastically reduce its consumption of freshwater in a world where that commodity is scarce and getting scarcer. Advanced technology also allows Coke to be bottled and sold in parts of the world with substandard water purification systems. The United Nations says an estimated 783 million people worldwide lack access to clean water. River basins are slowly drying up, and climate change, population growth, and pollution are depleting Earth’s groundwater sources, according to the World Bank. Looming water shortages are a big and growing risk for the global beverage and food industry. Coke, for instance, lists water as a major ingredient under stress in its annual financial report to the Securities and Exchange Commission. While the industry’s products are undeniably popular, none is essential to human existence. But water is. So water scarcity also presents the industry with a tricky public-relations challenge. Perhaps it’s not surprising then that while Coke and other beverage producers continue to draw criticism for sugary drinks, their record on water use compares favorably with those of other industries. A 2015 report on the water-use records of 37 global manufacturing companies by Ceres—a Boston nonprofit that works with corporations and investors on sustainability—found that the beverage and snack-food companies were doing the best job of reducing their water footprint. They’re companies that are highly susceptible to consumer blowback for poor environmental policies, Ceres notes. In fact, Coke—which placed a close second to Unilever in Ceres’s ranking of companies with the best water practices—learned that lesson the hard way in 2004, when it faced consumer backlash and had to close a plant in India over accusations (since rejected by a court) that the facility was siphoning water from a local community during a drought. Coke Chairman (and former CEO) Muhtar Kent labeled that event a “wake-up call” that pushed the company to make water management a priority and cut its consumption. Last year, Coke announced that it was on track to meet its goal of reducing use of water in manufacturing by 25 percent by 2020, using 2010 as a baseline. It has already reduced the amount of water needed to make one liter of soda to 1.98 liters, which means 0.98 liters are used in the manufacturing process. By 2020, it expects to bring the total down to 1.7 liters. To deal with scarcity, the first thing Coke considers is location, says Bowen, who has a doctorate in environmental systems engineering. “We really try to avoid siting plants where we know there is a water issue.” As part of that effort, Coke used sophisticated hydrological modeling to create a global map of water risk that predicts how vulnerable areas will be up to 50 years into the future. It’s since donated the map to the World Resources Institute, where it’s publicly available online. But Coke can’t always avoid setting up plants in water-scarce areas. For instance, it opened a bottling plant last year in the Gaza Strip, which endures frequent water-treatment and supply crises. The Democratic Republic of the Congo, where access to clean drinking water is reported to be among the lowest in sub-Saharan Africa, nonetheless has a Coca-Cola-licensed bottler of Dasani water. If Coke determines it has no alternative but to place a plant in a region where water supplies are tight, “we try very much to find sources of water that the communities don’t depend on,” says Bowen. Richard Crowther, a mechanical engineer who was Coke’s former director of environment and sustainability and is now a senior consultant for environmental consultants Antea Group USA, says aquifers are typically stacked, and communities in developing countries usually use the ones closest to the surface. That gives Coke space to drill more deeply, often thousands of feet, to find separate sources that don’t cross-feed into the community aquifers. For each of its plants, Coke does a Source Vulnerability Assessment every three to five years that looks at a number of issues, including susceptibility to drought, potential for contamination, pricing structure, and legal requirements. Each plant must then submit a Source Water Protection Plan that helps it devise efficiency, water treatment, and wastewater treatment programs. Those plans are also instrumental to Coke’s replenishment program. Last year, the company announced that in 2015 it not only met but exceeded its goal of returning to communities or nature an amount of water equal to the amount of product it produced. Between 2014 and 2015, it returned—either directly to sources used to manufacture drinks, or to areas outside those watersheds—some 50 billion gallons of water, or 115 percent of the water contained in its beverages that year, mainly via efforts like reforestation and reestablishing wetlands. Still, the whole soft-drink manufacturing process uses more water than is returned. To cut water usage in its bottling plants, Coke focuses on three steps: efficiency, technology, and production process design. Much of the technology used in plants is for treating water—both incoming water and wastewater. All water flowing into a plant is treated by the bottler, even potable water from dependable municipal sources. That’s because the water used to make drinks has to be as pure as possible to avoid altering the flavor. According to Crowther, the rule of thumb for all beverage plants is that, after treating incoming water, 80 percent will be usable for products and 20 percent will be rejected because it’s full of concentrated contaminants. (That ratio can range from 90/10 for plants receiving highly treated water to 70/30 for plants whose sources haven’t been pretreated.) The rejected water, however, can be further treated for non-beverage uses, including cleaning, feeding cooling towers, and flushing toilets. “You want to recycle it as many times as possible,” Crowther says. If the wastewater that is eventually pumped out is being returned directly to nature, the bottling plant will also treat it one last time. “It has to be clean enough that it can support marine life,” he adds. The technologies bottlers use to treat water vary. “Every plant treats their water somewhat differently,” Bowen says. “There is what we call a multiple barrier process, multiple barriers to contaminants.” These typically involve reverse osmosis, activated carbon filters, and chemical treatments. In the U.K., a bottling plant in Wakefield, West Yorkshire, recently installed a membrane ultrafiltration system, a pressure-driven purification process that gave it a tenfold reduction in wastewater generation. It was developed by Norit Membrane Technology, a Dutch company. Israeli company Atlantium Technologies has developed a chemical-free water disinfection system that uses ultraviolet light, fiber optics, and hydraulics. It’s now in use in around 250 Coke plants. Rotem Arad, an executive vice president at Atlantium, says fiber optics enable the sending of UV light long distances by reflecting it and using it over and over again. Traditional UV water treatments use light from one source, but that can create “a shadow effect” that allows some microbes to survive. “In our technology, basically nothing can escape.” The system can be used to take out pesticides and bacteria, but also to remove chlorine. Plants often use chlorine to disinfect water, which then must be dechlorinated before making sodas. “Otherwise it would taste terrible,” Arad says. Wastewater returned to nature also must be chlorine free. Another Israeli company, Blue I Technologies, makes advanced controllers and analyzers for water treatment and also has worked with many Coca-Cola bottlers. For bottlers, says Amit Shilony, the company’s vice president for North America, the focus is ensuring that the water is chlorine free, “which is interesting, because it’s harder than measuring how much chlorine is in the water.” The Blue I system can give early alerts to bottlers if it detects a problem, well in advance of the water being used in a product. The third and most complex—but important—step in cutting water use in beverage plants, Crowther says, is production process design. “That’s where the real opportunities exist” for savings. And that, essentially, comes down to industrial engineering.